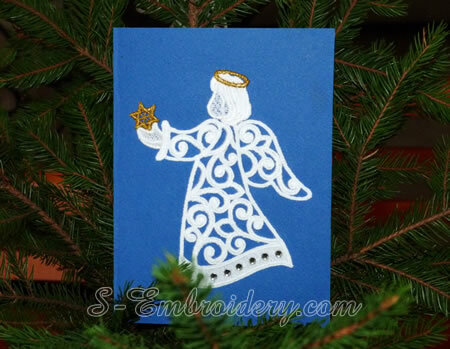 With this Christmas angel free standing lace machine embroidery design you will create a fine ornament for your Christmas tree or for your custom Christmas cards. The design comes in 2 versions - with and without a loop. Note: This is the size the embroidery will need in the working area of the hoop. The size of the ready angel (without the loop) would be approximately 4 x 4.95 inches (10 x 12.5 cm) for both versions. 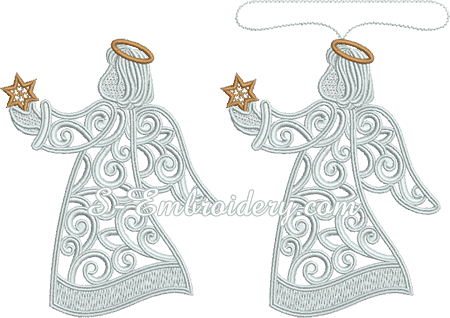 You receive 2 machine embroidery files and 1 PDF file with design information and instructions. We also have a large version of this design which is used to create a window ornament. 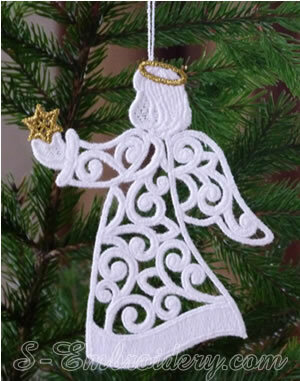 It is available as SKU 10627 Free standing lace Christmas angel window ornament.